Want to try some of the best cuisine in Italy? The food of the Cinque terre is a delight that needs to be sought out and included on any trip to the “Italian Riviera”. In fact, the food of the Cinque Terre —including pesto genovese, minestrone and focaccia, is a favourite of many frequent travelers to Italy, including me! Because Liguria is on the coast, seafood and fish are a big part of the diet here, and many of the region’s famous foods and recipes were first invented, or eaten, on ships or by fishermen. Not a big seafood fan? Don’t worry! The sea breezes and mineral-rich soils mean that the region is also famous for its herbs (especially basil and rosemary), wine, olive oil, pine nuts, porcini mushrooms, and other delicious foods. Want to make the best of your dining experience while traveling through the Cinque Terre or other parts of Liguria? Here are what food items to look for on the menu! 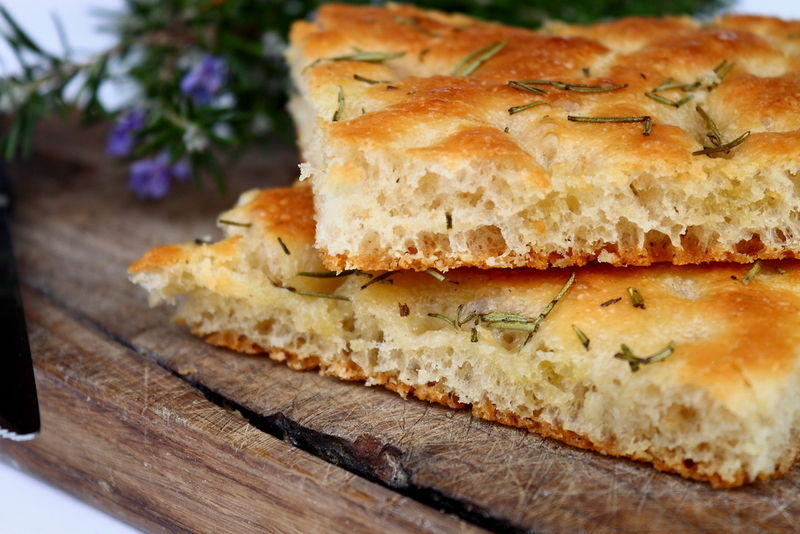 Focaccia: Ah, focaccia! This Ligurian bread has made its way around the world, and it’s no surprise: It’s delicious either on its own, dipped in sauce, or with a spread. A flattened bread (like a pizza without tomato sauce), it’s meant to be eaten hot from the oven. It might be flavored with anything from just olive oil and salt to cheese and sausage. And it’s a street food, so don’t feel as if you have to be sitting down at a restaurant to enjoy it. Farinata: Another Ligurian street food, farinata is a bread made from chickpea flour. As with focaccia, of course, olive oil and other flavourings (often rosemary or onion) are added in. It’s also best eaten piping-hot and fresh out of the oven. Latte brusco: Also called “frittura di crema,” this dish involves browning parsley and onion; adding flour, milk and egg yolks; and letting it all cool and harden before dipping it in egg whites, bread crumbs, and deep-frying the whole concoction in olive oil. Eaten hot, it’s a crusty, delicious snack, especially on a cold day! Carciofi violetti: Rome isn’t the only place famous for its artichokes. Liguria is, too—particularly Albenga. These tender-yet-crunchy artichokes pop up in sauces, pies, and frittate, and you might even see them eaten raw. Minestrone: Legend has it this famous soup was invented in Liguria, although, of course, we can’t be sure. But the story goes that soldiers from Genoa, serving in the First Crusade, made a meal by taking vegetables and herbs from the locals… then cooking them as a soup in their army helmets. Who knows if it’s true, but it’s certainly a fun story! 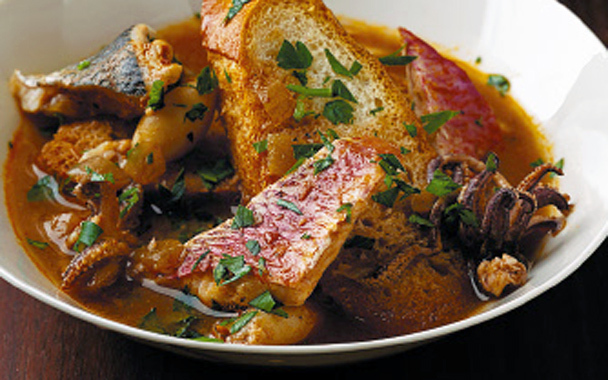 Ciuppin: Ever heard of “cioppino”? Well, that’s a dish that was developed by Italian immigrants in California in the 19th century—and it’s based on Genoa’s ciuppin. The original version, made up by fishermen on Liguria’s coast, was meant to use up the fish that were too small or damaged for anyone to buy. The fish are slow-cooked for up to two hours, making for a delicious soup. There’s also much less tomato than in the Italian-American version. 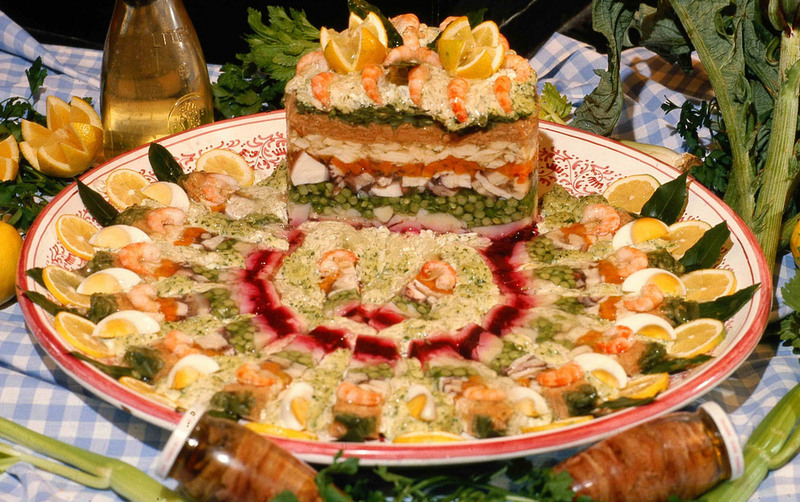 Cappon magro: This dish looks like a salad… but it’s much more complicated! Hard-tack biscuits (yes, a holdover from Liguria’s seafaring times) are soaked in olive oil and salt water. They’re layered on top in a pyramid (something that takes a fair amount of artistry, and balance, to pull off!) with a mixture of fish, shellfish, olives, and eggs, and dressed with a sauce flavored with anchovies and capers. It’s a traditional dish to eat on Christmas Eve. Corzetti: What are those funny little discs of pasta?Corzetti, of course! Coming from Genoa, they’re flat, round, and often embossed with a wooden hand-tool—something that not only gives the pasta a bit of decoration, but also lets it hold the sauce better. If you’re in Genoa, look for fresh pasta shops where they still handmake corzetti and stamp them. 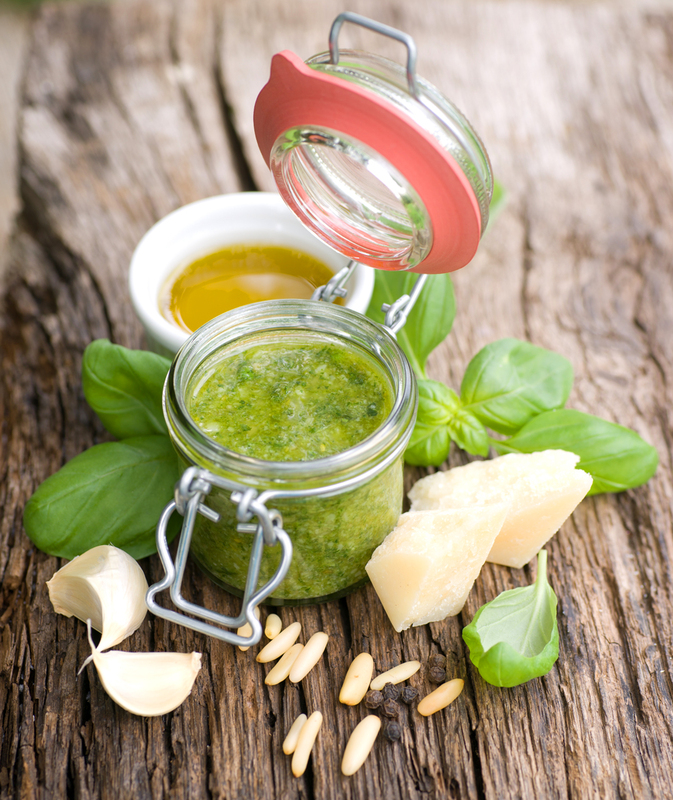 Pesto alla genovese: In short, while there are lots of kinds of pesto in Italy (“pesto” can refer to any paste of herbs that’s mashed up with a mortar and pestle), pesto alla genovese is the most famous. It’s D.O.P. protected, meaning it can only be made in a very precise way, with specific ingredients (including D.O.P. basil from Genoa), to be considered the “real thing.” The ingredients themselves are simple–basil, pine nuts, Parmigiano-Reggiano, Pecorino, garlic, salt, and olive oil—and when it’s done properly, it’s absolutely delicious over penne or another pasta! Pesto bianco: This is another kind of pesto, literally “white pesto,” that you can find in Liguria (aside from the famed pesto alla genovese!). It’s a paste of walnuts, olive oil, and fresh ricotta. Crema ai pinoli: Another pasta sauce from Liguria, this one is made from pine nuts, garlic, butter, and fresh marjoram. It’s especially popular in Genoa, where you’ll often see it on corzetti. Torta pasqualina: If you like some pastry with your greens, you’ll love this dish. 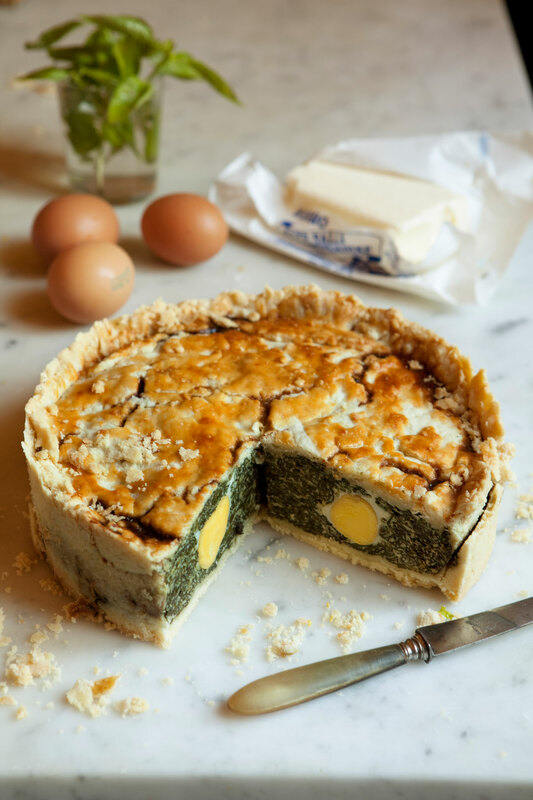 Pastry is layered with a mix of green chard, parmesan, ricotta, and other herbs, and the filling is indented with eggs and butter. The pastry layers are supposed to number 33. Sound random? Each one is for a year of Christ’s life—this dish actually got its start as an Easter tradition, although many people eat it year-round now. Pacciugo: An ice cream that hails from the area near Portofino, pacciugo includes bitter-chocolate ice cream mixed with whipped cream, fresh fruit, cherries, and a coulis of raspberry or strawberry. It got its start in the 1930s, and became an instant hit, especially with Portofino’s many tourists. Focaccia castelnovese: A bun made of cornmeal, olive oil, butter, and pine nuts, this is a Christmas and Easter tradition. Ravioli dolci: Like ravioli, but not! These “sweet ravioli” are envelopes of sweet egg dough, filled with a pesto of citrus peel, candied squash, citron, and beef marrow. Meringhi genovesi: Cake soaked in rum or another liquor, filled with apricot jam, and topped with vanilla meringue, this is a cake for tose with a serious sweet tooth! Pandolce: This literally means “sweet bread,” but it’s not what you’re thinking—it is a cake, not offal! According to legend, the 16th-century Doge of Genoa, Andrea Doria, invited Genovese chefs to submit recipes for a food that would represent the Republic’s wealth, as well as be nutritious, durable and suitable for long sea voyages—and so pandolce was born. 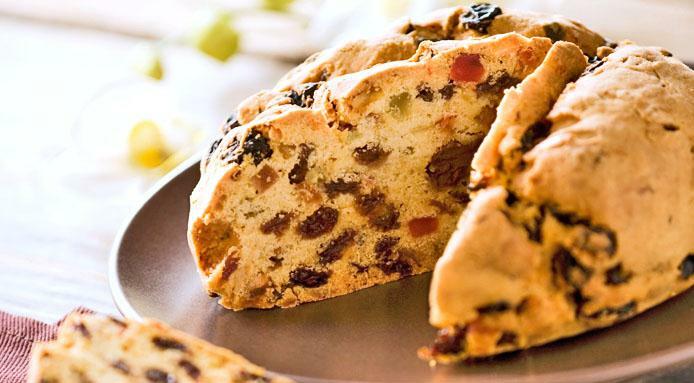 It’s dense, crumbly, and filled with spices and candied fruits, and it’s generally eaten only at Christmas. 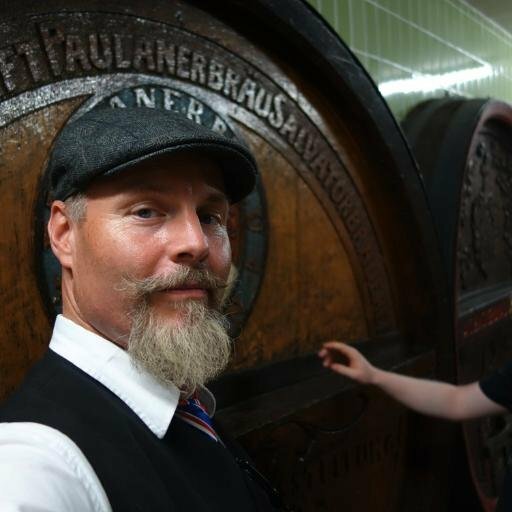 Eat and Drink Like a European is dedicated to the absolute best in European travel experiences. All of our tours feature authentic regional cuisine! We also do travel consulting, and can help you find the places the locals eat on your independent trip to Europe. Contact our chief tour director Craig Bresett for more information.